The castle is named, not after St. Hilarion the Great, the founder of monasticism in Palestine who died near Paphos about A.D. 371, but after a later saint, of whom little is known. He is counted among the three hundred saints who according to local tradition, sought refuge in Cyprus when the Arabs overran the Holly Land. His relics were preserved in the castle and "kept right workshipfully" according to an English visitor in the 14th century. It may be presumed that he retired to this hill-top to live the life of a hermit and that as the hermitage of St. Neophytos near Paphos, a monastery was established to shelter those who should follow his example, as well pilgrims to his tomb. The original castle, to which the monastery gave place formed part of the Byzantine defense of the Island, which included castles of Kyrenia, Buffavento and Kantara also. The date of its construction is not recorded, but probably it was in the late 11th century. Alternatively, the building of the castle may have formed part of the measures taken by the Emperor Alexis I for the greater security of the Island, following a serious revolt in 1092. The earliest references to the castle are found in the contemporary accounts of Richard Lionheart's campaign in the Island in 1191. 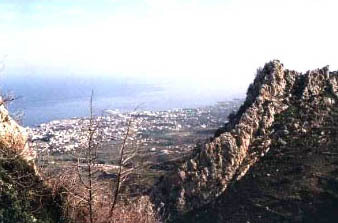 After Richard's victory at Tremethousha, where Isaac Comnenus was captured, St. Hilarion and the island remained to be reduced. When Richard fell ill at Nicosia he assigned this task to Guy de Lusignan. Kyrenia, after a brief attack, was surrendered together with family and treasures. St. Hilarion was next invested but resisted vigorously until Isaac ordered its surrender; whereupon Isaac's daughter was placed in the castle to prevent her being recaptured by his supporters. At this time the castle was known as Didymus (the Twins), from the twin crests which crown the mountain peak on which it is built, a name which the Franks corrupted to Dieudamour (Dieu d'Amour). The castle was probably strengthened in the early years of the Lusignan kingdom. It was organized for defense in 1228, when the Hohenstaufen Emperor Frederick II, on his way to Palestine, landed at Limassol and demanded the regency of Cyprus during theminority of the young King Henry I, on the ground that the Lusignan had received their crown form the Emperor's father Henry VI in 1197. After abortive parleys, John d'lbelin, who held the regency in succession to his brother Philip, whom the High Court of Cyprus had appointed, defied the Emperor and retired to St. Hilarion. lbelin had already provisioned the castle and had sent the women and children of his supporters there for safety. However a truce was ultimately arranged during which lbelin joined the Emperor's crusading expedition. On his return to Cyprus the next year (1299), lbelin found Frederick's supporters in control of the Island. He engaged and defeated them near Nicosia, whence they retired to St. Hilarion, which they surrendered after a nine-month siege. The roles were again reversed in 1232, when the King and lbelin were absent in Syria. A force of Frederick's Longbard troops overran the Island; the King's sister and supporters took refuge at St. Hilarion; which the Imperialists invested. Capitulation was narrowly averted by the return of young King Henry from Syria. His army fell on the besieging forces and routed them at Agirdha where the road from Nicosia enters the Kyrenia pass, a success which was followed by their capitulation at Kyrenia and put an end to Frederick's claims to Cyprus. Untouched by warfare for the next 140 years, the castle, improved and embellished, seems to have become a summer residence for the Lusignan royal family. In 1373, while the Genoese invaders ravaged the Island, on the pretext of avenging the death of a few compatriot during an incident at the coronation of Peter II, John Price of Antioch, Regent and uncle of the young King, took refuge in the castle. He had with him his faithful guard of Bulgarian mercenaries, who made effective sallies against the Genoese besieging Kyrenia Castle. When the King and his mother Queen Eleanor had made peace with the Genoese, ceding them Famagusta, the Queen sought to avenge herself against the Prince for his part in the assassination of her husband, his brother King Peter I. Persuaded by the Queen that his Bulgarians were plotting to kill him, the Prince summoned them one by to the top of the castle and had them thrown into the abyss below. A few days later, defenseless, he went down to Nicosia, never to return. After the occupation of the Island by the Venetians in 1489, the new administration ordered the dismantling of this and other castles to save the cost of their garrisons. The castle is named after St. Hilarion, a hermit monk who fled from persecution in the Holy Land and lived and died in a cave on the mountain. Later in the 10th century the Byzantines built a church and monastery here. 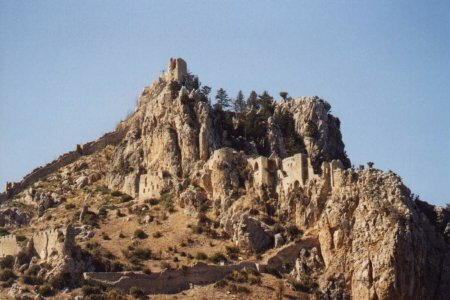 Along with Kantara and Buffavento, St. Hilarion Castle was originally built as a watch tower to give warning of approaching Arab pirates who launched a continuous series of raids on Cyprus and the coasts of Anatolia from the 7th to the 10th centuries. A monastery and a church were built here in the 10th century. The first references to the castle are found in the 1191 records. For some time it was of strategic importance, but later it became the summer resort of the Lusignan nobility. Especially after the invention of firearms and the increasing importance of defending the coastline it lost its functionality and importance like the Kantara and the Buffavento castles. The castle has three parts. 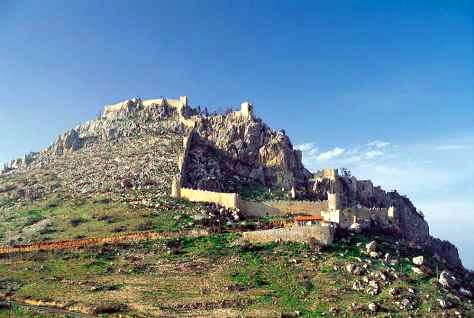 The parapets for the defence of the main entrance were fortified by the Byzantines in the 11th century. The lower section of the castle was being used for the soldiers and the horses. The middle section contained the royal palace, the kitchen, the church and a big cistern. At the entrance to the castle in the upper section there is a Lusignan Gate. There is a courtyard in the middle. The nobility used to live in the Eastern section, the kitchen and the other rooms for daily use were in the western section. The panoramic view through the Queen’s window (a window carved in the Gothic style) on the second floor of the royal apartments is superb. The Prince John Tower is at the top. When the Venetians captured Cyprus in 1489, they relied on Kyrenia, Nicosia and Famagusta for the defence of the island and St. Hilarion was neglected and fell into oblivion. In its main outline and arrangement the castle remains as the Byzantines built it, but many sections in their present form are Frankish, the work of those who rebuilt and improved the castle under the Lusignan kings. and the upper ward, between the twin crests of the summit. The outer gate, beside which stands the restored gate house now a refreshment room , leads into the Barbican, a small outwork protecting the main entrance . The latter retains its semi-circular Byzantine arch above a later opening; the carved corbels of the brattice which overhung it also belong to the original work. Within this entrance to the lower ward is the reroofed inner gate-house, now the Custodian's office . The LOWER WARD is the largest section, the burg as it was called, where the men-at-arms and animals were quartered, but it lacks important buildings. 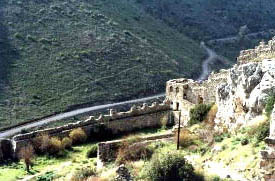 The long wall encircles it and climbs to close with the defenses on the summit is Byzantine work. It has seven semi-circular towers, in one of which quarters have been provided for the Custodian . From the Custodian's tower to that next in to the west the parapet walk along the battlements has been put in order. The large cistern built against it is again in use. Near the south-west corner of the lower ward, the path passes the STABLES , a vaulted Frankish building entered by an archway high enough for a camel or a mounted knight. In the nearby corner-tower two of the wooden floors have been restored to indicate the original subdivision into three storeys: a store below and two upper levels, each with loop-holes towards the exterior and a pair of arches opening inwards, into the lower ward. The Middle Ward is reached through a massive Gate House, a Byzantine shell within which the Lusignan masons have devised a vaulted passage in cut stone, originally closed by a drawbridge passing through the passage and up the steps to the right. The Church is reached, a Byzantine structure formerly covered by a large dome. The latter was carried over a square nave on right arches of irregular spans. The arches on the east side were reconstructed in 1959 in order to support the vaulted roof to prevent its collapse a narthex to the west and an annex to the north of it are likewise constructed in the Byzantine ecclesiastical manner. The church and its annexes, which far exceed the needs of a castle chapel, warrant the assumption, already mentioned, that the first substantial structure on the site was a monastery, successor to the hermitage of the saint. The existence of ready-made accommodation in such a monastery would explain the choice of this site for a castle, for which in some respects it is ill-suited. The church is an inexpert example of its type, which is represented elsewhere in Cyprus at the Antiphonitis monastery near Ayios Amvoios, and must be relatively early in date though hardly earlier than 965. A.D. Traces of two coast of paintings survive on the south wall, the second of 12th century style, perhaps dates from a restoration of the church after the Byzantines had converted the monastery into a castle. The buildings to the south of the church , have for the most part fallen. North of the church steps lead down to a vaulted passage of Frankish construction separating it from the HALL , rebuilt in the 14th century, but now lacking its steep wood-and-tile roof and also the floor which divided it from the cellars below. Some earlier masonry surviving in the end walls suggests that a similar hall existed in the Byzantine castle. Possibly this earlier hall originally served as the Refectory of the monastery. The same passage leads into the Belvedere, a vaulted loggia commanding fine views through its open arch-ways. This and the vaulted kitchen block to the east of the hall, to the east of the hall, to which we pass, date in their present form from the Lusignan period. The buttery , if such it be, between the hall and the kitchen, is of more primitive construction and had a terrace roof supported by rafters carried on transverse arches. Below it is a cistern lately restored to use. The kitchen block, where chimney flues are visible at more than one point, is arched over a crevice in the rock on the south side to provide an outlet for a group of privies. From the kitchen there are two alternative routes. The visitor with little time to spare should descend the wooden steps leading down to a terrace outside the cellars of the hall , from which the main route to the top of the castle is regained. For the longer route, return to the Belvedere and follow the stone steps and passage which lead down, under the kitchen into the buildings occupying the eastern extremity of the middle a building of importance. It probably housed the royal apartments in the 13th century before the more spacious quarters in the upper ward were build. Later repairs included the addition of a step-pitch tiled roof, of which the east gable survives, the modern steps at the east end of this building lead up to a terrace , the most easterly point in the castle, commanding a wide panorama of land and sea. Descending to the basement level, a row of massive vaulted chambers is reached , Frankish 14th century work, probably barrack accommodation. In a small yard to the east are the remains of a kiln in which roof-tiles were made . Ascending the long flight of stone steps and passing, on the right the remains of buildings constructed on top of the vaulted barracks, the direct route to the top of the castle is retained. At the exit from the middle ward was a gate . Outside it, a postern and an enormous open Tank, both of Frankish construction complete the features of this main section of the castle. The tank served to store winter rainfall from the natural catchment area above, for building and other requirements in the summer months. The tank stands at the bottom of the gulley up which a zigzag path climbs to the Upper Ward. The entrance is through a Frankish arch set in rougher, Byzantine wall and protected by a tower akin to those of the lower ward. The courtyard within is flanked by the twin crests of forming the summit. At the east end are service buildings of Frankish date, including a kitchen with the remains of an oven. On the west the courtyard is closed by the Royal Apartments, a fine, but much-damaged Lusignan buildings of the 14th century . A passage, which leads below it to a postern , and a cistern occupy the basement level. From the vaulted hall on the ground floor, which was sub-divided by partitions, the upper level can be reached from a restored staircase at the south end. The upper chambers were covered with a steep-pitched, tiled roof and originally they could also be reached from external gallery throughout the length of the inner wall. 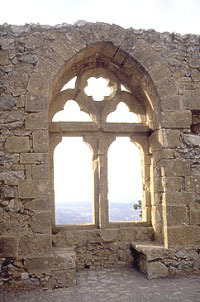 The west wall retains at the south end one of its traceries windows with side-seats, popularly known as the "Queen's window". At the other end a passage leads to a substantial, but primitive closet . Descending to the courtyard by the staircase from which the gallery was reached, the visitor passes the remains of a group of subsidiary buildings and cisterns. From the courtyard a short climb gains the top-most rampart. On the southern crest, and the Summit , 732 m. above the sea, from which a splendid panorama is obtained. This rampart with its square towers , which were covered with flat roofs on rafters, is early Frankish work. But it replaced a less substantial Byzantine wall with round towers, of which a trace survives below the western tower . Descending, by the same route, the adventurous, after leaving the upper ward, may visit the Prince John's Tower , by keeping right, route leads to a strong and isolated tower standing at the center of the castle, its vaulted Frankish construction suggesting a 14th century date. With sheer precipices on three sides this is surely "The donjon-tower where the great precipice is " the place, according to the chroniclers, where the Prince of Antioch's Bulgarians met their unenviable end. On the return journey most of the middle ward can be by-passed through a passage and tunnel , the latter surviving from the Byzantine monastery. From the passage the isolated Castellan's Quarters are reached . These are of Frankish construction and include a vaulted cellar below and, and a main chamber above (re-roofed in 1938), the latter communicating with a closet and, through a service hatch, with a small vaulted kitchen . On returning to the Costadian's Tower those with time to spare can explore the eastern section of the lower ward, where the outer wall crosses a steep slope to close against the cliff of rock on top of which the middle ward was built. Here was a postern and here, as elsewhere, cisterns were constructed against the inner face of the wall . High on the slope, below the church, are the much ruined remains of a bath building of Byzantine date . Who is St Hilarion the Great? St. Hilarion (~371 AD) was an abbot and monastic pioneer of Palestine. He studied at Alexandria, where he became a Christian. He visited St. Antony, then at the height of his fame, but returned to Palestine, found his parents were dead, gave all his belongings to his brothers and to the poor, and became a hermit at Majuma in about 306 AD. His regime was based on St. Antony's: he lived on figs, bread, vegetables, and oil. First, he made a shelter of reeds, later a very small cell. Disciples came to learn from him and large crowds were attracted to him by his austerities and miracles. For the sake of his monks he had come to own household goods and a farm. To escape these responsibilities and the crowds, he left Palestine, first for Egypt, then for Sicily (where his disciple St. Hesychius found him), and eventually for Epidaurus in Dalmatia. Once more his miracles attracted publicity and he fled to Cyprus. He settled near Paphos, but later retired to a more remote site about 20 km away, where Epiphanius, Bishop of Salamis, visited him. St. Hilarion died at the age of eighty. He was buried near Paphos, but his relics were translated to Majuma. Memory Celebrated on October 21.